In Hollywood blockbusters, explosions are often among the stars of the show. In space, explosions of actual stars are a focus for scientists who hope to better understand their births, lives, and deaths and how they interact with their surroundings. Using NASA's Chandra X-ray Observatory, astronomers have studied one particular explosion that may provide clues to the dynamics of other, much larger stellar eruptions. 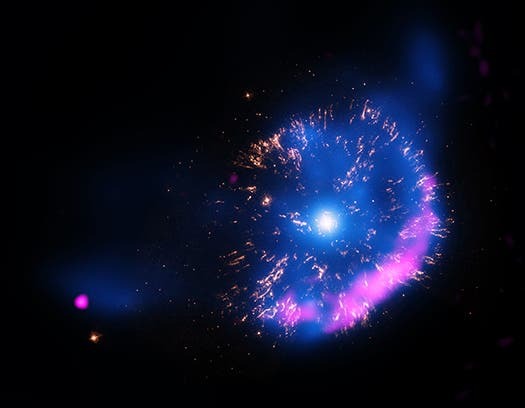 This new image of GK Persei contains X-rays from Chandra (blue), optical data from NASA's Hubble Space Telescope (yellow), and radio data from the National Science Foundation's Very Large Array (pink). The X-ray data show hot gas and the radio data show emission from electrons that have been accelerated to high energies by the nova shock wave. The optical data reveal clumps of material that were ejected in the explosion. The nature of the point-like source on the lower left is unknown. This new image of GK Persei contains X-rays from Chandra (blue), optical data from NASA’s Hubble Space Telescope (yellow), and radio data from the National Science Foundation’s Very Large Array (pink). Ancient Black Hole Discovered –12 Billion Times Mass of the Sun!